"An electric car is only as good for the climate as the electricity used to power it. And in states that rely heavily on fossil fuels like coal and natural gas for their electricity there are many conventional and plug-in hybrid electric vehicles that are better for the climate than all-electric cars." That there is the opening line from a recent study-based report released by Climate Central. "But that is just part of the story. Another critical factor is the carbon emissions generated when a car is manufactured. Emissions from producing the battery and other electrical components create a 10,000 to 40,000-pound carbon debt for electric cars that can only be overcome after tens, or even hundreds of thousands of miles of driving and recharging from clean energy sources." "This comprehensive state-by-state analysis of the climate impacts of the electric car, plug-in hybrid electrics, and high-mileage, gas-powered hybrid cars takes both of these factors into account – the source of energy for the power grid and carbon emissions from vehicle manufacturing." 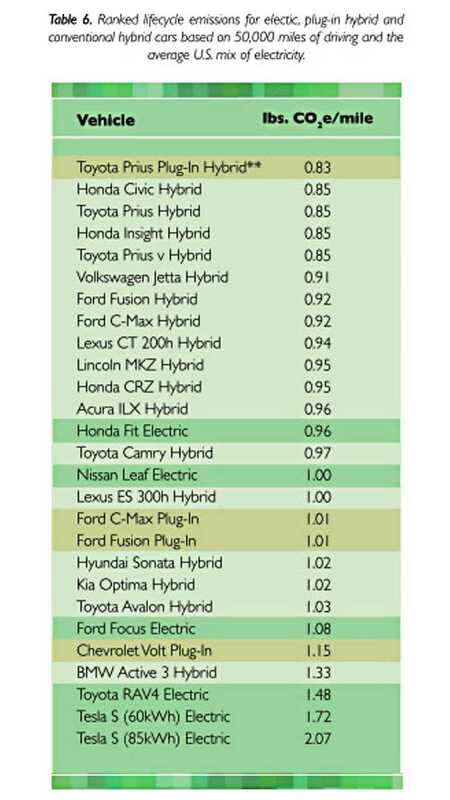 "In 39 states, a high-efficiency, conventional gas-powered hybrid, like the Toyota Prius, is better for the climate (produces fewer total “lifecycle” carbon emissions) than the least-polluting, all-electric vehicle, the Honda Fit, over the first 50,000 miles the car is driven." 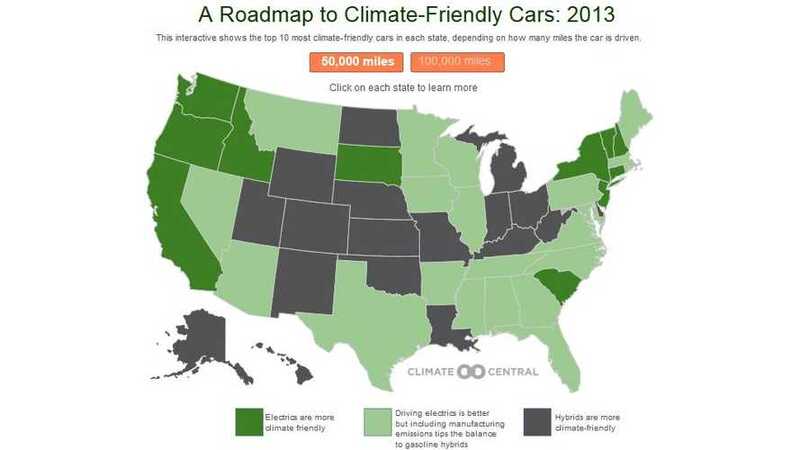 "In 26 states, a plug-in hybrid is the most climate-friendly option (narrowly outperforming all-electrics in 11 states, assuming 50:50 split between between driving on gas and electric for the plug-in hybrids), and in the other 24 states, a gas-powered car is the best. All-electrics and plug-in hybrids are best in states that have green electrical grids with substantial amounts of hydro, nuclear and wind power that produce essentially no carbon emissions. Conventional hybrids are best in states where electricity comes primarily from coal and natural gas." "For luxury sedans, in 46 states the gas-powered Lexus ES hybrid is better for the climate than the electric Tesla Model S, over the first 100,000 miles the car is driven."